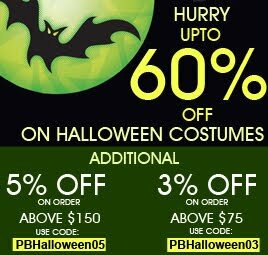 If you are still wondering of you could grab your favorite Halloween costume, you can place an order on PartyBell and surely will receive before Halloween. Just make sure to place your order today before 2pm CST and we will ship it the same day and as per different shipping options viz Economy, Standard, Express and Premium. Read the header on the PartyBell for exact dates. Valid till 31st October, 2016.